One of our senior correspondents, a transcontinental truck driver in the 80s and 90s, often tells me a story of an unusual Citroen he encountered one night on a French autoroute. It appeared to have been based on a Citroen CX but had an extra axle, an unusually high roof and was emblazoned with the words “SERVICE DE PRESSE”. It overtook him at north of a 100mph, fast and close enough to shake his 40 ton Scania 141. So we had to know, what was this Frankenstein machine, where was it going and who was driving it? We don’t realise how lucky we are in today’s world to have information at our fingertips. The instantaneous nature of the internet has spoiled us. How quickly we’ve forgotten the infrastructure of information, probably because today that infrastructure is invisible in the form of wireless signals and below ground fibre optic cables. Newspapers did somewhat streamline the distribution of information but they were still hampered by one fundamental issue; physically transporting the newspapers from the press to the highstreet retailer. Despite the many technological advances of the 20th Century, newspapers still presented this logistical problem. With Global Stock Market Trading taking off in earnest in the 1970s, publications like the London based Financial Times found there was huge demand for their papers all over Continental Europe. Papers carried stock prices and news of big mergers and bankruptcies. This information had a sell-by-date and it needed to be in the hands of those making big decisions within 1 working day. Taking again the example of the Financial Times, their European edition was printed in Frankfurt, Germany. If that needed to be on the shelves of a newsagent in Rome, Italy by the following morning, it needed to travel 1,200km. That is 12 hours of driving according to today’s Google Maps. Even with modern trucks, a standard 7.5t rigid would never make it on time. Enter a French man with a very French solution. 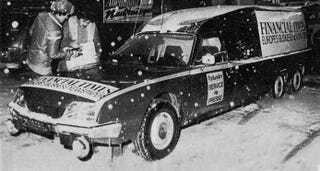 Pierre Tissier, recognising the adaptability of Citroen’s front wheel drive DS and CX chassis, began chopping and extending these cars and adding an extra axle. Et voilà, you had a vehicle capable of carrying a metric ton of newspapers at, and often exceeding, motorway speeds. It should be noted that many of Tissier’s creations had more exciting functions than newspaper deliveries. For example below is stretched CX carrying a helicopter used for filming at the Dakar Rally. The versatility and variety of CX and DS conversions is something we’re going to cover in a separate article. While not as glamorous as carrying a helicopter or ferrying Citroen racecars about, these Trans-Continental Paper Delivery Boys provided a valuable service. They were the internet before the internet in a way. Keen to discover more about the day to day life of one of these drivers, I contacted Phil Collins who, as far as we can tell, is the only person to own a 6-wheeled Citroen CX in the UK. Which, by the way, he uses to tow a caravan he built from a Piper Comanche aircraft but that is a story for another day. Phil maintains an impressive website, www.thejoyofcx.co.uk, detailing his adventures with his bizarre French Space Shuttle. Obviously I don’t have any experience of running newspaper, and my information comes from the same source as yours i.e. the internet. But, I did have the car on show at The Bromley Pageant of Motoring a few years back, and I was approached by a Dutchman who told me he used to deliver back in the 1980s. They would load up with newspaper at 11pm in Amsterdam, and he had to drive to the south of France to deliver the papers; he would then sleep in the back, and drive back to Amsterdam more slowly. And did the trip three times per week! Let us consider the journey Phil’s Dutch friend is describing, taking South of France to mean Marseilles. Amsterdam to Marseilles is a distance of 1,234km. Lets say your average French newsagent opens at 7am (and you probably have more than one to visit) that leaves 8 hours to cover that distance, requiring an average speed of 154km/hr (96mph). Now that might not seem like a lot but consider this journey is not being undertaken in a GT car. We’re talking 100mph in a Frankenstein machine, a butchered diesel Citroen with an extra axle and 1 ton of newspapers with the ink still drying. For 8-16 hours. 3 times a week. This was Cannonball Run for minimum wage. Phil also kindly supplied us with some clippings from a March 1983 magazine article by the late Russel Bulgin that follows a typical day for a Hollander S.A. driver. Bulgin details the pressures felt by a Service de Presse driver, describing the implications of a mere 15 minute delay and the frantic scrambling to get moving again after each drop-off or checkpoint. We feel there was something very noble about this job, a routine race against time to ensure the world was informed. These brave men were the 20th century embodiment of the horseback riders battling the elements to bring news from the frontline. Its a job we’d have relished in another life. Huge thanks to Phil Collins at http://www.thejoyofcx.co.uk/ who was more than happy to answer my questions and went to great lengths to dig out old articles and photographs. We highly recommend checking out his site, and his fascinating projects.